With widespread human deprivations and inequalities, the challenges of development over the years have remained enormous. So at the beginning of a new millennium, the world has adopted the Millennium Declaration and the Millennium Development Goals (MDGs) to reduce basic human poverty by 2015. Today, the world is at a crossroads with impressive but uneven progress on some fronts, significant gaps remaining and new challenges emerging. With less than three years to go, the present book focuses on the analytics of the Goals from a broader perspective, highlights the success stories, indicates how to accelerate the MDG progress, identifies how to sustain MDG progress and proposes how to frame the post-2015 development agenda. The basic idea is to have a better understanding of the issues related to the MDGs, to generate a development discourse and policy dialogue, and to induce debate on the post-2015 development agenda. 1. 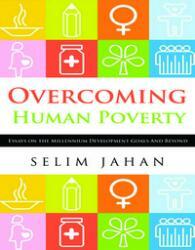 Human Dignity and the Millennium Development Goals: Analytical Linkages / 2. Democratic Governance for the Millennium Development Goals: An Analytical Framework / 3. Capacity Development for the Millennium Development Goals: Analytical Linkages and Policy Options / 4. Accelerating the MDG Achievements: Identifying Solutions to Constraints / 5. Accelerating the MDG Progress - Four Country Case Studies: Colombia, Lao PDR, Togo and Uganda / 6. Accelerating the MDG Progress: Success Stories and the Factors Behind / 7. Sustaining the MDG Progress - Notions and Issues / 8. Sustaining the MDG Progress During Economic Shocks / 9. Development Dialogues Beyond 2015 - Rationale and Issues for Setting a Set of Global Development Goals / 10. Post-2015 Development Agenda: Proposal for a Comprehensive Framework.